Fabulous Ideas from Demos put to use! The other day I was blog browsing as must of us do. I came across a post by Amy Rysavy that had these glitter ornaments. I just loved them. I knew I had to find out how to make them. Many years ago I created my own swirl ornaments with acrylic paints. I was thrilled with how they turned out but it required a lot of drying time. With these ornaments they weren't too terribly messy. Love that! Once you add the glitter it soaks up the rest of the ink. I did let them dry overnight but I don't think that was necessary. Amy has a great tutorial here. Then I came across Kimberly Van Diepen's post and knew I needed to add the Snow Flurries to the ornaments. What a great idea. Especially since I have a bag left over from my Snow Flurries classes. I'm thrilled with how well these turned out! I used the following re-inkers: Ballet Blue, Night of Navy, Pacific Point, Old Olive, Kiwi Kiss, Glorious Green, Rose Red, Real Red and Riding Hood Red. The ornaments were Clear from Michaels. I hope you like them. Leave me a comment to let me know what you think! The Snow Flurries are only available until Jan 18th. Don't miss out on them. 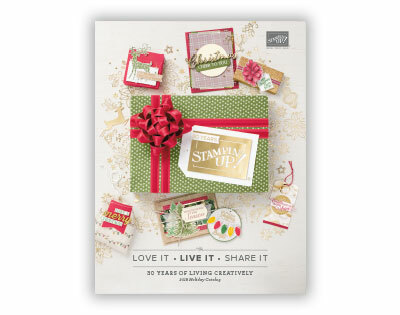 They are in the Holiday Mini Catalog. Update: The teachers from Mom's school loved the treats from the previous post. It's so nice to get great feedback from something you have made...don't ya think! Tomorrow I will post the treats I made for my Husband's office. 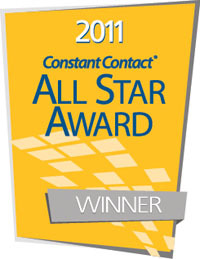 They were so quick and easy to do this year thanks to the BIG SHOT!!! I'm loving this tool! 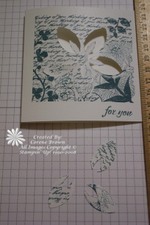 This is a sample of the Fresh Cuts Notes and Stamp set that will be featured in the new catalog on August 11th! 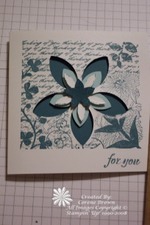 It's simple and easy-to-use with a unique size and an elegant floral design laser-cut in the middle of the card front. The following is a tutorial on how I created this card. Its so easy, you can too! 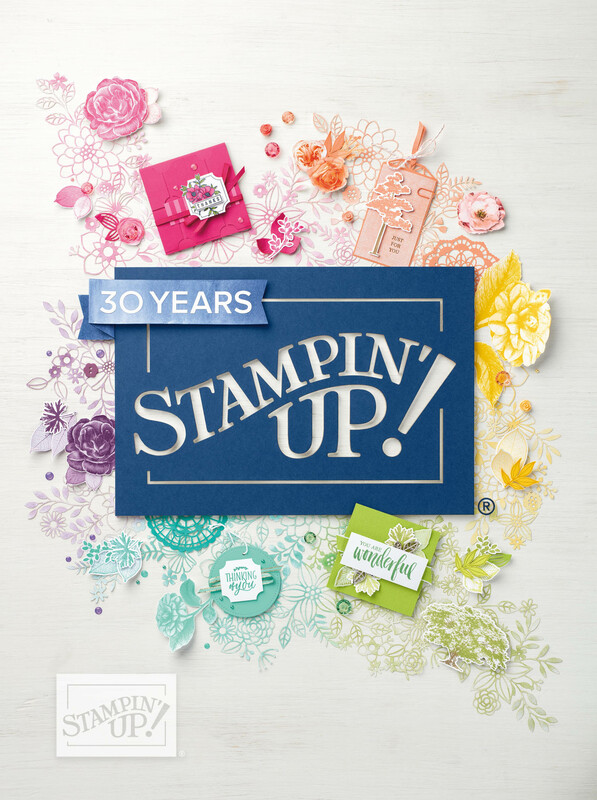 Step 1: Stamp the large stamp in the color of your choice. Be sure to leave enough room at the bottom of the card for your sentiment. 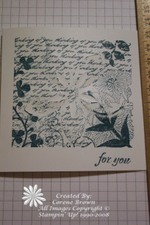 For this card I used Blue Bayou which will be retiring on August 10th....so sad to see it go! 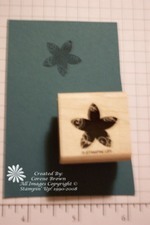 Stamp "For You" at the bottom of the card. Step 2: Take out the removable petals. 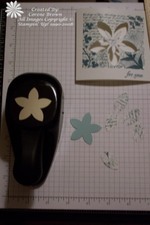 Step 3: Using the 5 Petal Punch, punch out a Petal in Softy Sky Cardstock(another retiring color). 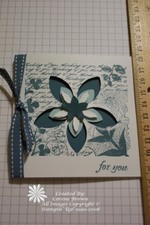 Step 4: Adhere the Soft Sky Flower to the inside of the card using a dimensional. Step 5: Adhere a Blue Bayou 3 3/4 x 3 3/4 square with dimensionals over top of the Flower. Step 6: The inside of your card should look like this. Step 7: This picture is blurry~Sorry! 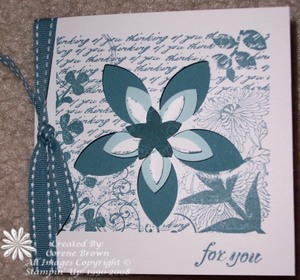 Stamp the little flower in Blue Bayou on Blue Bayou Card Stock. Cut out the Flower. 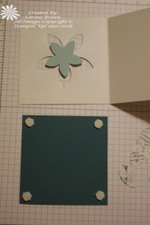 Step 8: Adhere the flower to the front of the card with a dimensional. Step 9: Tie a ribbon around the side of the card. That's it, you are all finished.